It’s not about what you want to do, where you want to live, or what you want to accomplish. It’s about who you want to be. Located at the base of the Rocky Mountains, Boulder, Colorado, is known as one of the best places to live in the United States, with 300+ days of sunshine per year. Boulder is easily accessible, with over 80 miles of bike and pedestrian paths, a convenient public transportation system, and close proximity to Denver International Airport, servicing many non-stop flights around the world. International Student Budget: Estimated annual cost is $55,861, covering tuition and fees, on-campus room and board, health insurance, and books and supplies. Financial Aid: International students are eligible for a few highly selective merit-based CU Boulder scholarships but must submit official ACT or SAT scores with their complete admission application by January 15 to be considered. The University of Colorado Boulder, home to more than 3,100 international students from 106 countries, has a dynamic and diverse community of scholars and students. 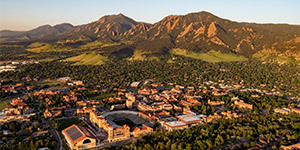 Located at the base of the Rocky Mountains, CU Boulder’s Tier 1 research university is one of only 34 US public research universities in the prestigious Association of American Universities. CU Boulder’s facultyand staff help all students fulfill their potential and achieve their academic and career goals through world-class teaching, research, and service to the global society. The city of Boulder is a leading force in research, technology, and entrepreneurship—a place where innovation happens. At the heart of the city, CU Boulder produces some of the best and brightest in these industries and is a primary source of Colorado’s highly skilled workforce. CU Boulder’s talented faculty, students, and alumni are leading the way for the next generation by inspiring innovative, humanitarian, and social enterprises. Our emphasis on a customized education combined with our dynamicacademic programs, hands-on learning opportunities, and rigorous coursework are at the cornerstone of the CUBoulder student experience. 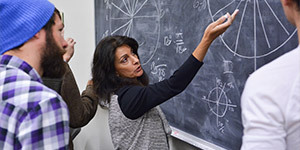 Withinour supportive learning community,you’ll interact with our exceptionalfaculty—who include Nobel Laureates, MacArthur Genius Grant Fellows,US Professor of the Year awardees, and National Medal of Science winners—who will be listening, questioning, and helping you refine your ideas so you can develop a broad understanding of the world, strongleadership skills, and an enhanced ability to think critically. 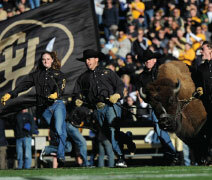 CU Boulder has eight colleges, schools, and programs: the College of Arts and Sciences; College of Engineering and Applied Science; College of Media, Communication, and Information; College of Music; LeedsSchool of Business; School of Education; School of Law; and Programin Environmental Design. Among them, we offer more than 3,900 academic courses across 150 fields of study, enabling you to create an academic experience that is totally unique to you. At CU Boulder, the hard work happening in our classrooms, labs, recital halls, and studios is complemented by the remarkable beauty that surrounds us. Appreciation for our iconic Rocky Mountain locale comes easily in Boulder, and as a result, we have one of the most active college campuses in thenation, where recreation, sports, andstudent groups play key roles in theunique CU Boulder experience. Within our inclusive community, you’ll find many ways to get involved and make lifelong friends. And you’ll have the opportunity to serve the greater good through volunteerism and civic engagement, whether it’s around the world or across the street. CU Boulder graduates continue to Be Boulder as they enter the workforce or begin their graduate school education. With their hands-on experience, world-class education, and ability to think critically, globally, and creatively, they benefit from a strong salary potential,high employment rates, and the opportunity to find and excel in a career they’re passionate about. • 94% of CU Boulder international graduates were employed or in graduate school within six months of graduation. • 85% of employed CU Boulder international graduates find jobs in the US. • 77% of CU Boulder international graduates were employed by graduation. Live in spectacular surroundings andlearn in a campus environment of extraordinary opportunities. Come to CU Boulder and discover the possibilities.